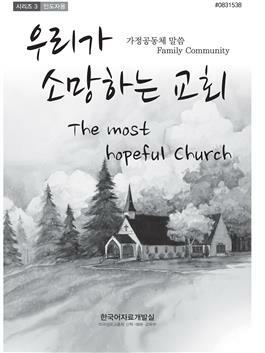 The Most Hopeful Church 2017 Family Community is designed to study 12 New Testament churches including Jerusalem Church, Antioch Church and seven churches in the Revelation. These churches represent not only churches in the past but also churches today in its strength and weakness. They demonstrate their unique callings and gifts as well as failures and shortcomings. They challenge us to be faithful to our calling as body of Christ and to be transformed as truly people of God.